To obtain good vegetable harvest, you must observe some agro-technical rules, most of which is crop rotation. This is to ensure that the soil does not accumulate pests and diseases that can hinder the normal development of plants and to deprive the farmer of a considerable part of the crop. The concept of crop rotation was put into use relatively recently, it is the successive planting of various vegetable crops in order to maintain the productivity of soil and reduce the number of diseases that can be transmitted through the soil. It is important to know which family includes vegetables, as in this case, pests, diseases and preferences they are similar. Tomatoes belong to the Solanaceae family as pepper, eggplant and potato. This means that they cannot be alternated in the garden with these cultures. Most preferred option: to plant tomatoes after the Cucurbitaceae, leguminous plants, beet, carrot, turnip and onion. Tomatoes and peppers are affected by tobacco mosaic virus, Fusarium blight, spotted wilt virus, which is transmitted by thrips. When planting tomatoes in the open ground should be an overall written plan garden plantings several years in advance, given the characteristics of the plants, their preferences and peculiarities of cultivation. To develop a detailed plan, you can use the long winter evenings, to read professional literature, consult with experienced gardeners on gardening forums and websites, to consult with specialists. Ideally, you need to change the place of landing of vegetables annually, this rule applies to tomatoes. However, this requirement can create some problems for gardeners if the cultivation of tomatoes used stationary greenhouse. In this case, growers often are the little tricks that in most cases, be completely justified. 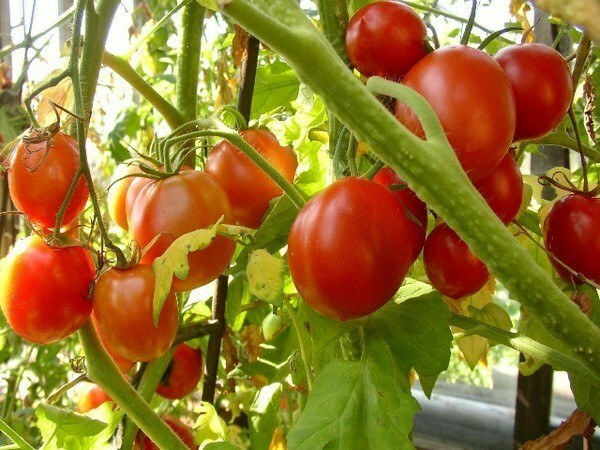 Can be placed on the plot, two greenhouses and plant them in alternating tomatoes and cucumbers, these plants do not have common pests and diseases. At the same time in the same greenhouse, these vegetables can not grow – this will cause the death of cucumbers, which are more demanding to the growing conditions, humidity and temperature, in addition, they will be depressed neighborhood with tomatoes. If you have to use one greenhouse for growing tomatoes, you need to choose plants that tolerate the neighborhood with tomato bushes green plants, lettuce, radishes and annually alternate the planting inside the greenhouse. Another way is to change annually the top layer of soil in the greenhouse to reduce the incidence of tomato. For this spring you need to remove a layer of soil of 25-30 cm, pour it on the vegetable beds and a greenhouse put in fresh fertilized soil from the garden. The disadvantage of this method is its large complexity. Before planting in the soil of seedlings of tomatoes need to shed holes of hot strong solution of potassium permanganate, and the soil enriched with lime-pushonkoj before deep digging in order to reduce its acidity. Good effect in the fight against fungal diseases gives treatment of the bushes with a solution of copper sulphate. To prevent destruction of fruit Phytophthora, it is time to reap the harvest: at lower night temperature to + 4oC need to collect all the tomatoes and put them in boxes to ripen. Some gardeners recommend to handle the green fruits in hot water to avoid their damage.